This paper aims to complement work done within the WIOD project (the ‘World Input Output Database’ project financed by the EU’s Seventh Framework Programme), which compiled supply and use tables for 40 countries, covering about 85% of the world economy. 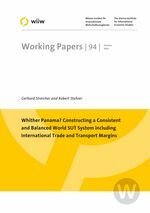 The paper describes the derivation of international trade and transport margins (TIR services) together with a consistent and balanced system of supply and use tables at the world level. As a by-product, this also yields supply and use tables including valuation matrices for the Rest of the World, the approximately 15% of the world economy not covered by the 40 countries included in the WIOD database. The procedure assures a ‘balanced world economy’ with respect to trade in all goods and services.